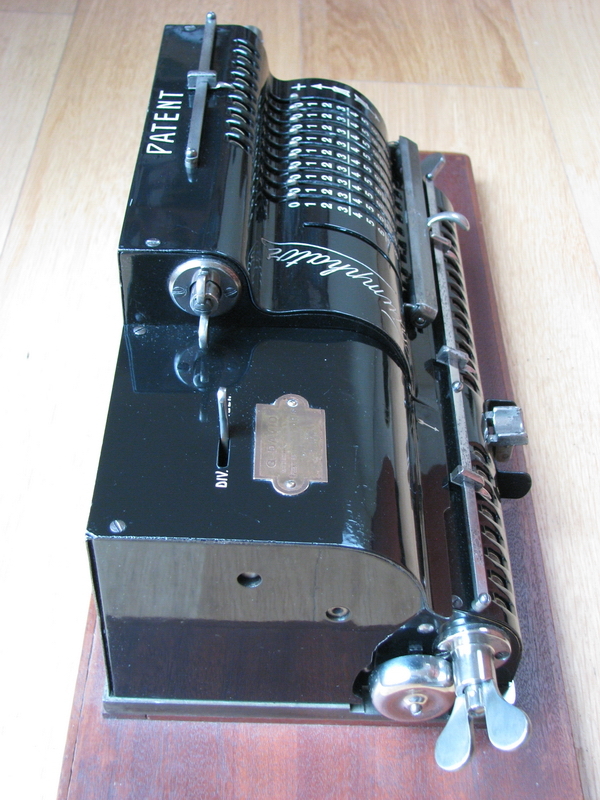 This is a page about the giant 1st generation Triumphators, the dinosaurs among the pinwheel calculators. 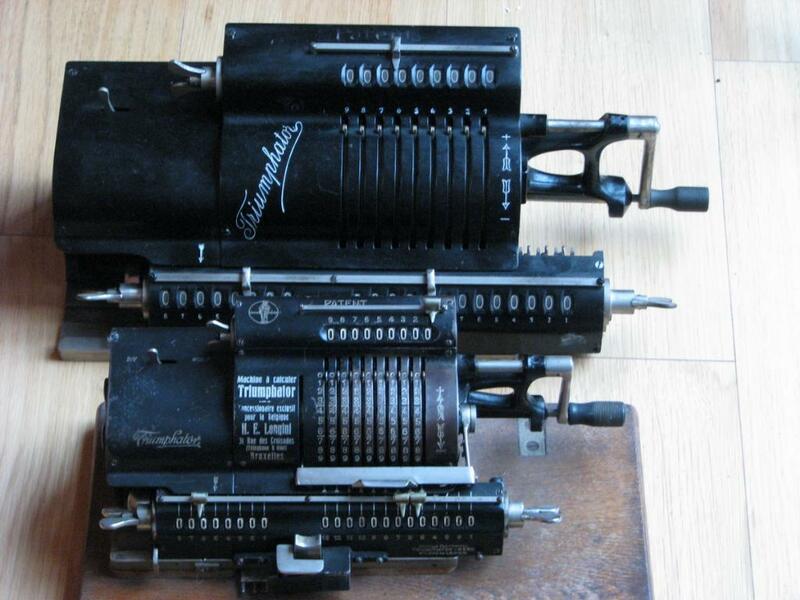 The Modell I is the largest pinwheel machine in my collection (apart from the Sanders, but that is electric). Back then bigger was clearly still better. 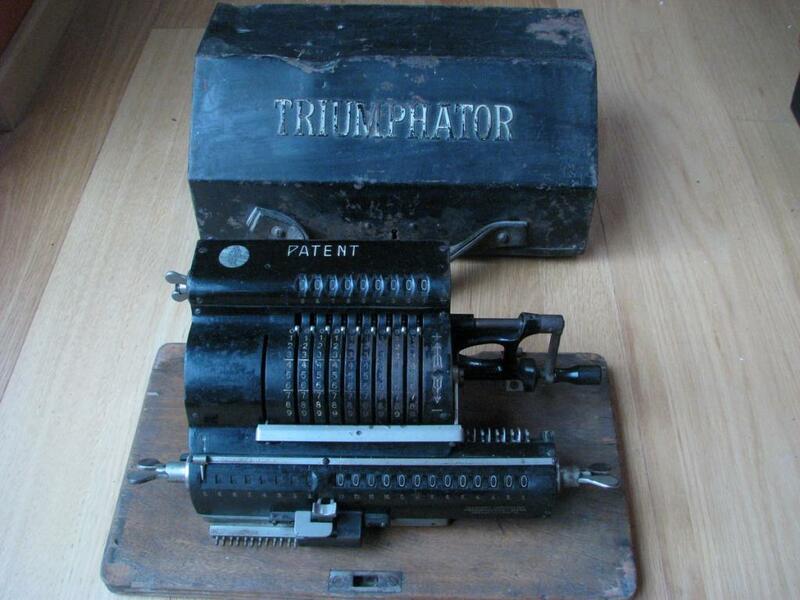 The reason for the lack of numbers on the input field of the large Triumphator is patent-related. 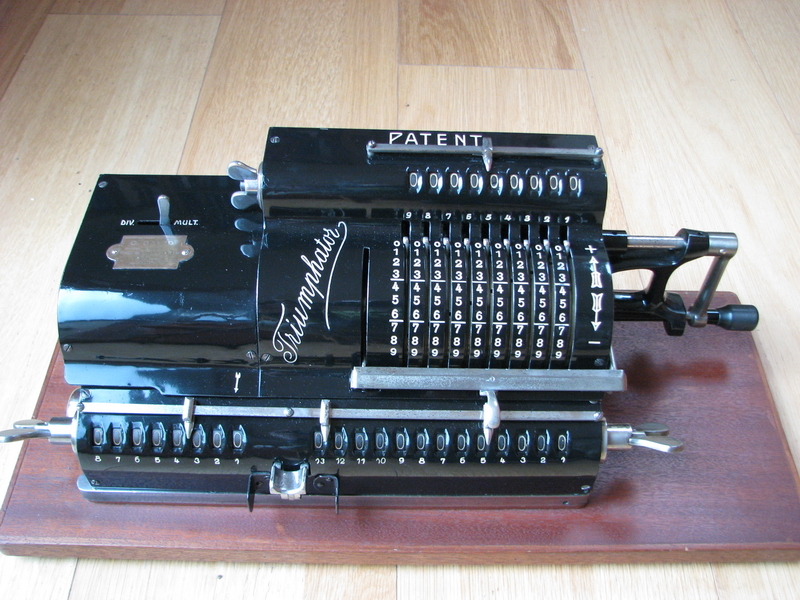 Apparently Brunsviga and Odhner patented numbers on an input field. 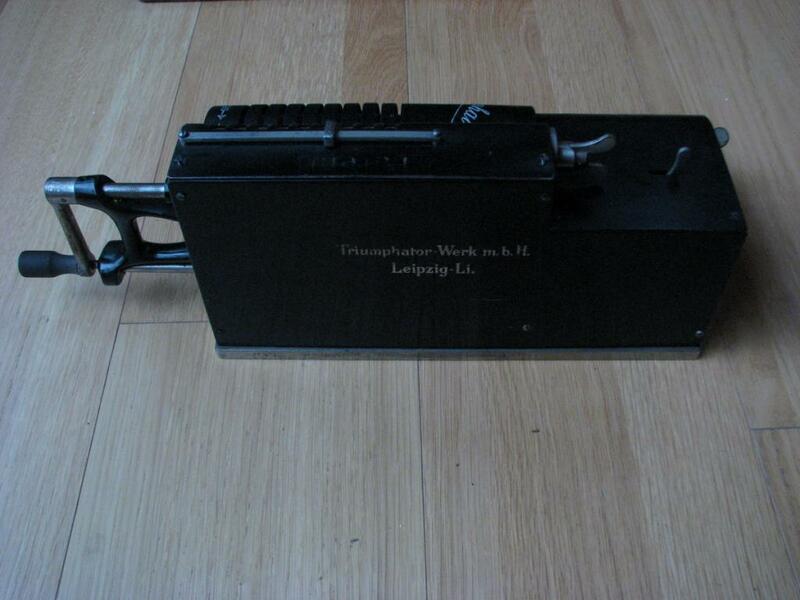 Since the Triumphator Werk didn't want to pay for the use of this "innovation" they developed the input control register, and didn't number the input field itself. Notice also the shape of the pins and the slits - the pins have a wider tip soldered on to be easier on the fingers, and hence the top and bottom of the slit need to be a little wider so the tips can pass without catching the edge. This particular machine was repainted, but the decals were taped off, which gives a bit of a funny effect. Technically, it is fine though, and still just as solid as on the day it was made. 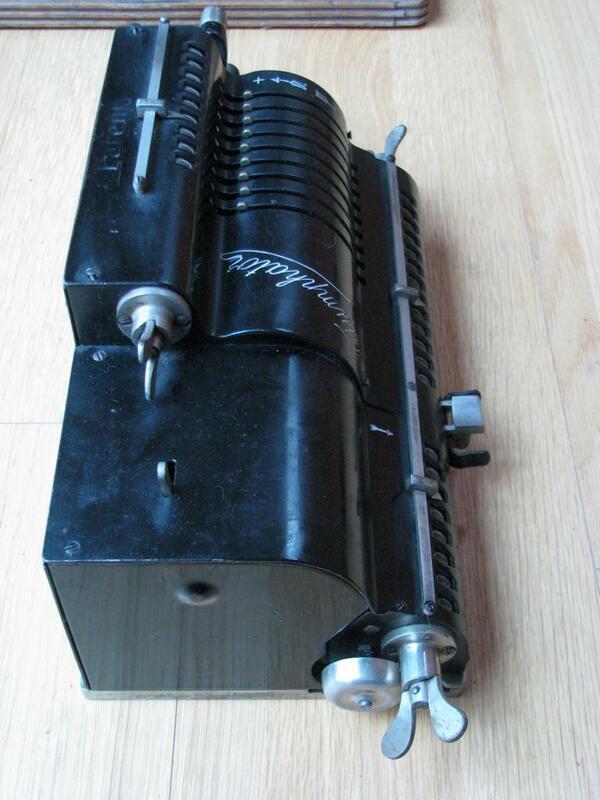 Machine N° 4455 was sold at a collector's meeting on the same day I bought the Triumphator I from Freddy Haeghens's collection at Breker's. 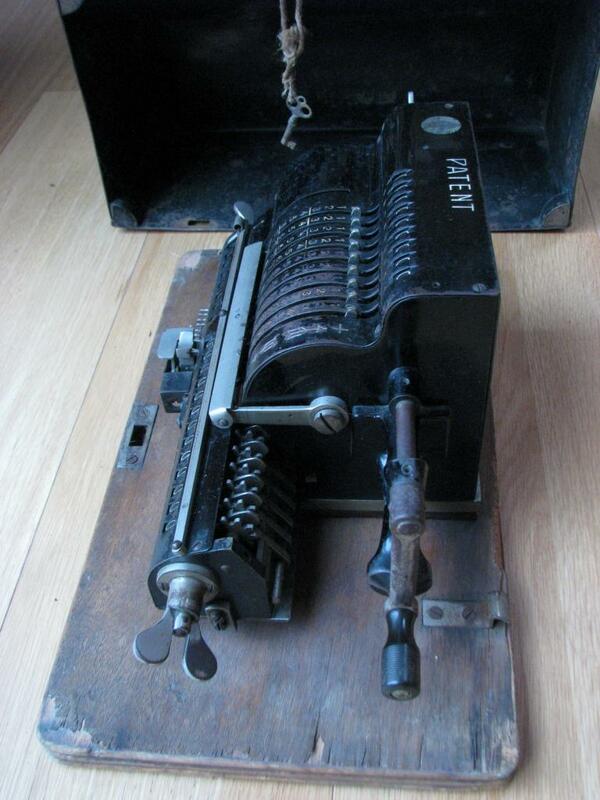 This machine, N° 7115, is in pristine condition. 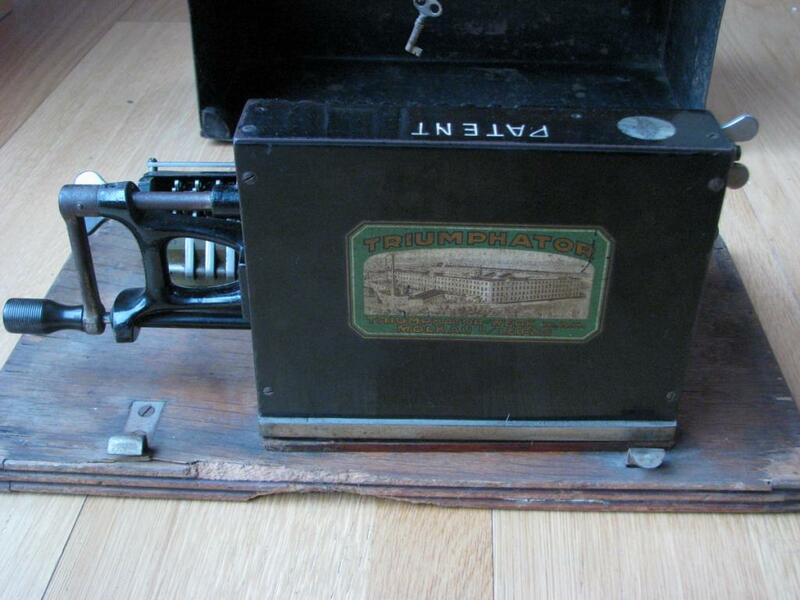 It was sold in Paris by G. David, sole importer for France. 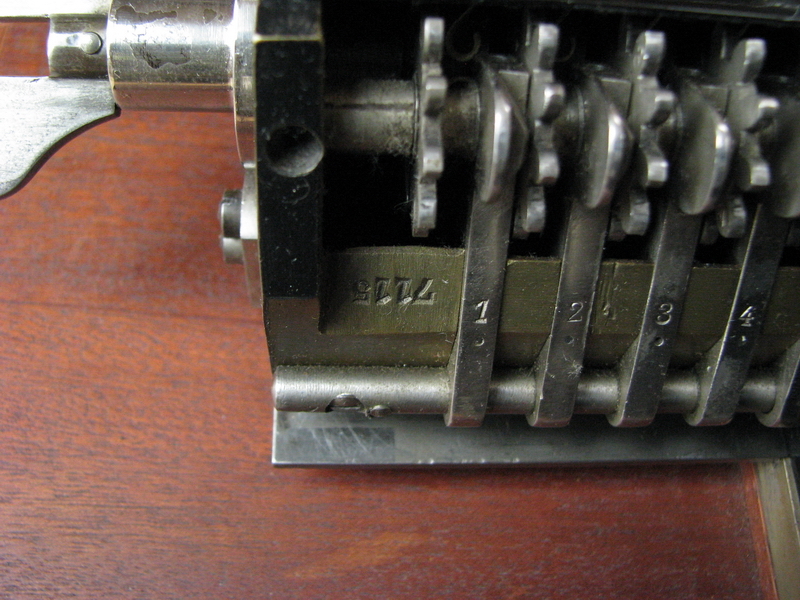 The serial number dates it to 1914, just before the outbreak of hostilities, and just after numbers started to be stamped on the input fields. 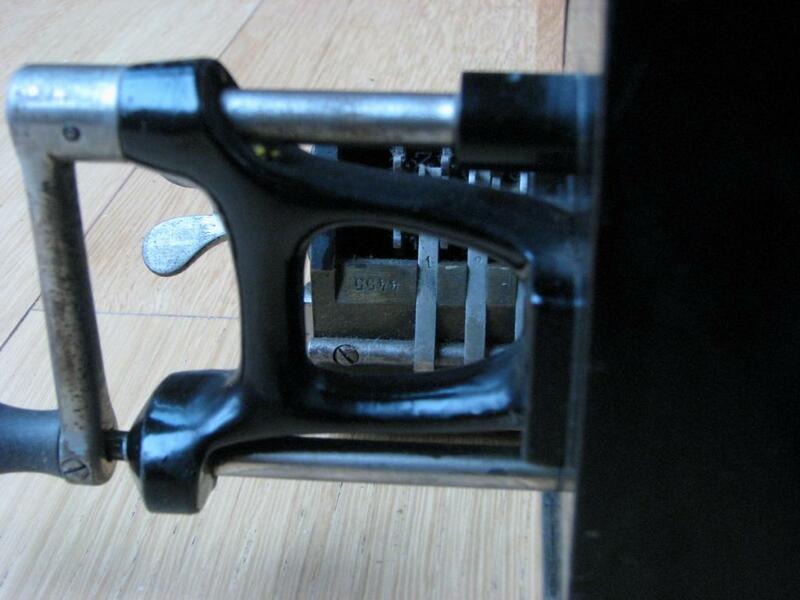 ANother difference is the "PATENT" which is stamped into the top plate of this machine, but was a decal in the earlier machines. 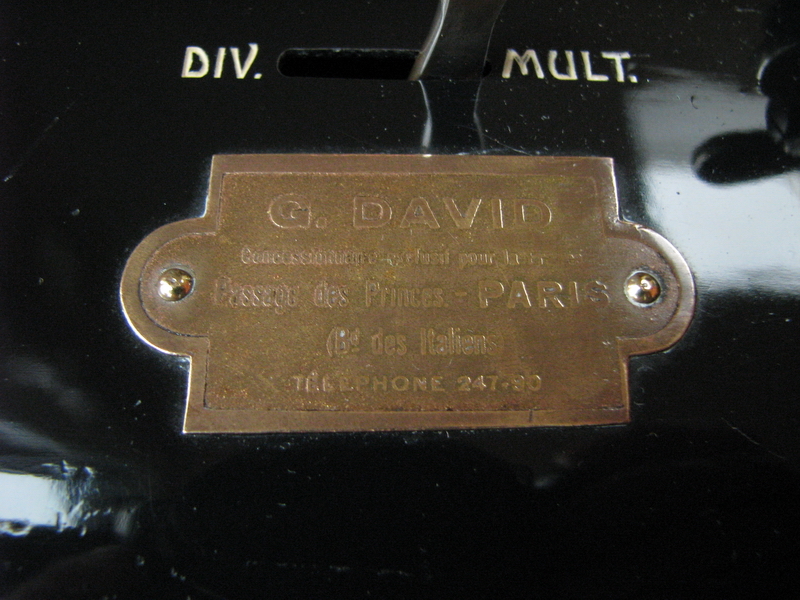 G. David was located in the "Passage des Princes", a covered shopping passage in Paris at the Boulevard des Italiens. The entrance at 101 Boulevard Richelieu is much better conserved. 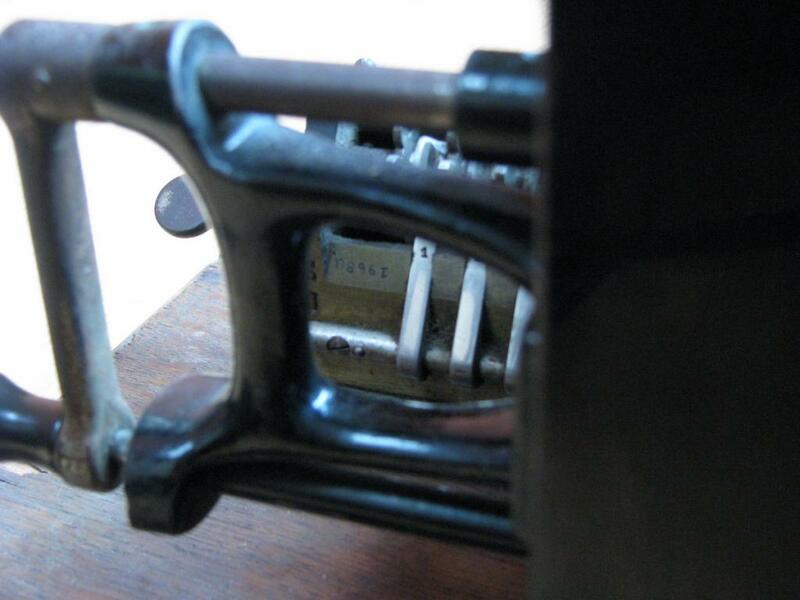 The plate affixed to the machine carries a five digit phone number, consistent with 1912, more than a decade beofre automatic telephone exchanges made their appearance in the French capital: 247-90 was in the telephone zone "Gutenberg/central, série 200", with a two digit number for the business, in this case, 90. The machine is in beautiful condition, has what I think is the original paint, and was mounted on a new wooden board by Freddy. It cleaned right up to be very presentable indeed. 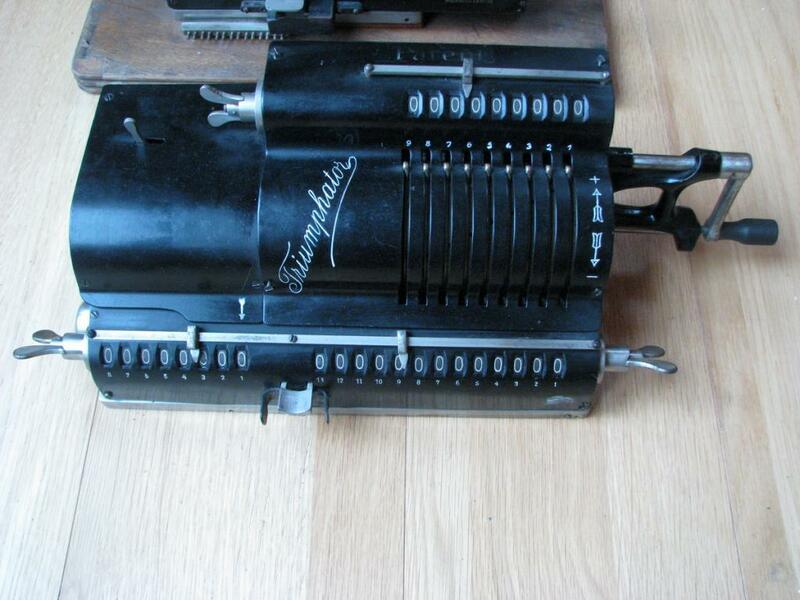 What is funny is that many parts have the serial number stamped into them. However, at the inside of the carriage cover, someone grabbed the wrong number stamp - the number stamped there is 7105 instead of 7115. Either that, or the covers were mixed up at the factory during last-minute adjustments... Odd. 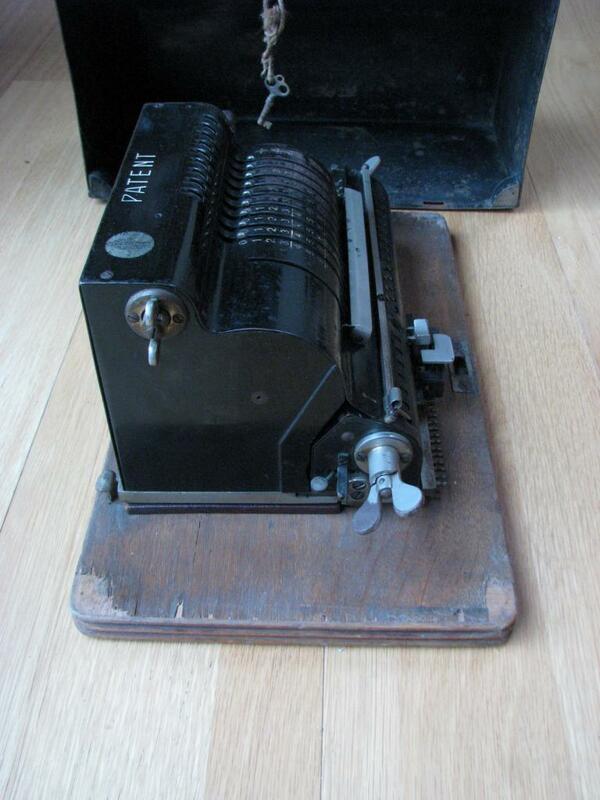 The next machine is what I think is a Modell V - it is much later (serial N° 19680), dating to just after the Great War in 1919. 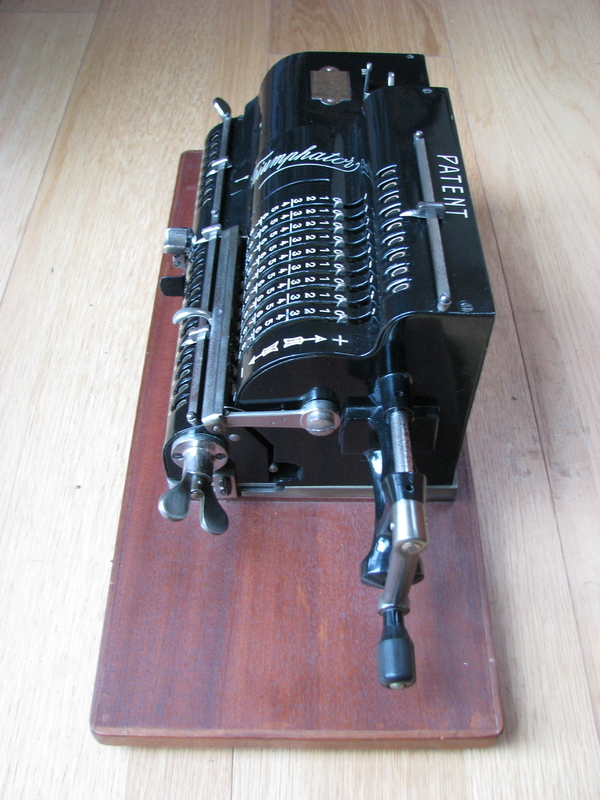 By then the patent for numbers on the input field was long forgotten, and Triumphator was also here more than happy to make use of them, still retaining the input control register, but for customer comfort it would have been a "must" anyway. 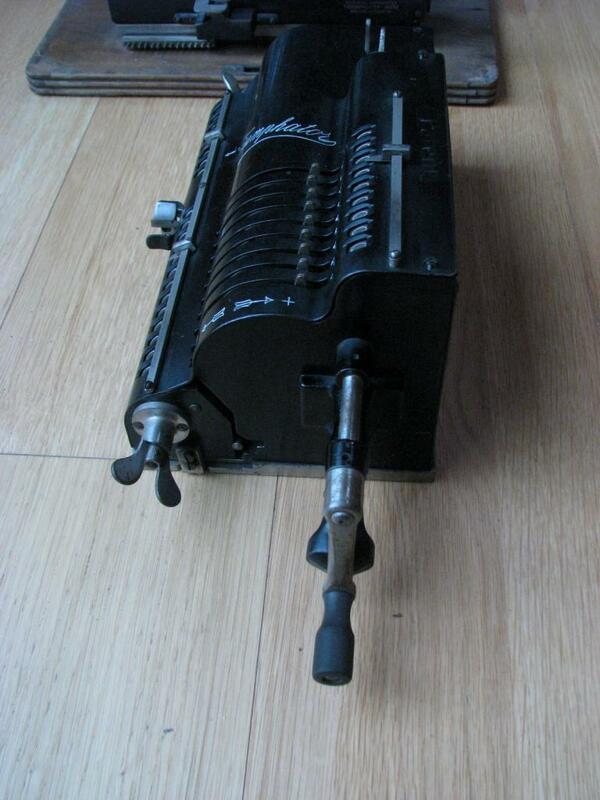 This machine is the same size as the Modell I, but it doesn't have tens' carry in the revolution register. A nice touch is the presence of the (slightly distressed) tin cover for the machine, even if someone has attached his belt by way of a handle. 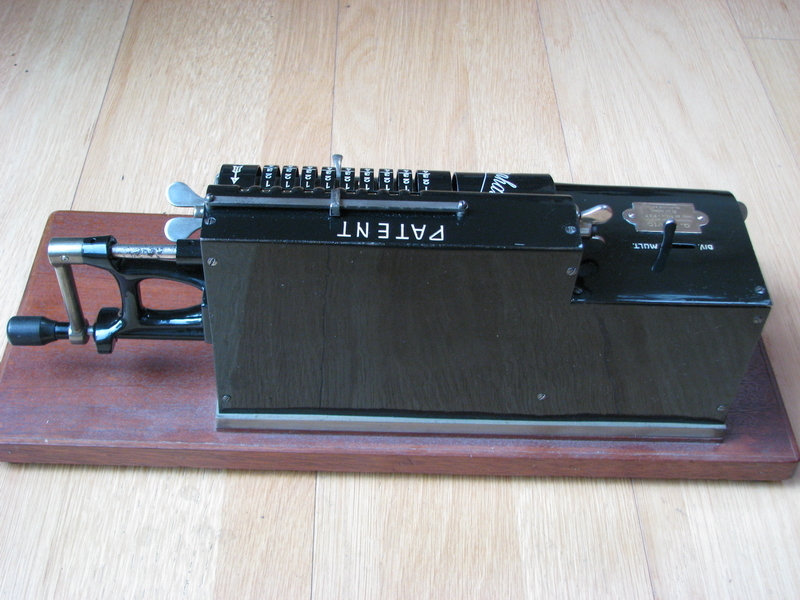 Finally, a picture of the Modell I with a much later and much smaller Model C, just as a size comparison.